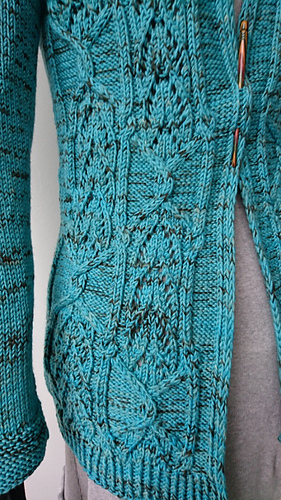 The cardigan is knitted from top down. You will start with the back and sleeve stitches and work flat while increasing for sleeve and raglan and shaping both fronts. Once body and sleeves are divided, you will shape the body and knit down to the hem rib. The sleeves are knitted at last in round. a- Bust circumference: 36½ (39¾, 44, 47½)49¼, 51, 54¾ inches; 93 (101, 112,121)125, 130, 139 cm approx. 2/2¾ inches; 5/7 cm positive ease included. b- Yoke depth: 8 (8½, 9, 9½)10½, 11¾, 12½ inches; 20 (21, 23, 24)27, 30, 31½ cm. c- Sleeve length from underarm to cuff: 19¾ inches; 50 cm. d- Length from underarm to hem: 19¾ inches; 50 cm. e- Upper sleeve circumference: 10½ (11½, 12¼, 13¼) 15½, 16½, 17 inches; 26 (29, 33, 35) 40, 42, 44 cm. using The Baby Wool by We are knitters – 100% Baby Alpaca – 123 yards; 112 meters per 50 gr – colorway 401 Grey (8 skeins). Needles: US7; 4.50 mm circular needles and dpns. Other: stitch markers, cable needle, waste yarn, tapestry needle for weaving, 9/10 buttons about 1¼ inch; 3 cm diameter.